A long-needled fast growing pine, Red Pine reach heights of up to 120 feet, with a bare trunk reaching over halfway up the tree as it reaches maturity. Their needles are up to 6 inches long, making for a very tall tree with a “crown” of branches and needles at the top. Often found growing in sandy soils and rocky terrain, Red Pine adapt well to very poor soil and can live as long as 400 years. It does not tolerate shade, but does tolerate high winds and drier soils, and is naturally resistant to common needle blights. 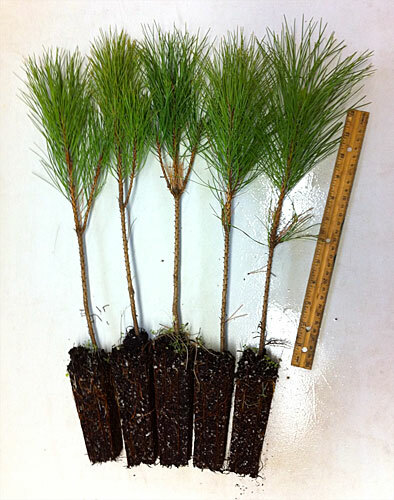 Red Pine are often planted for forest and wildlife habitat, and are common in most Northern States. This handy species of pine should be viewed as the swiss army knife of evergreen trees, and a good addition to many landscapes.